Biederworlf was a well-know Presbyterian fundamentalist at the turn of the century. He once headed the Winona Lake Bible Conference (1922) and taught at Winona Lake School of Theology (1922-33). A study like this from a generation gone by (1907) is always a cultural reminder of how much the church has changed. 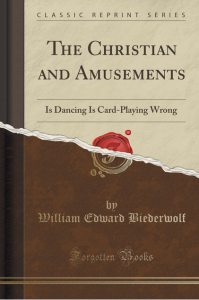 His three subjects are dancing, card-playing, and theater attendance. Can you imagine the antipathy such preaching would create among Christians today? But read his reasons before you judge.